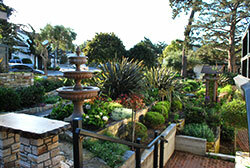 Church of the Wayfarer is a beautiful facility with historic significance in the heart of Carmel-by-the-Sea. 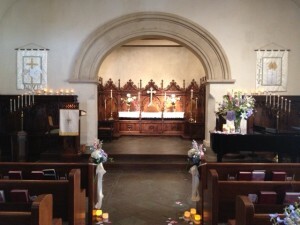 From the colorful gardens to the quaint, wood-paneled sanctuary, your Carmel wedding at Church of the Wayfarer will be surrounded by beauty and tranquility. Please read on for more information about the areas within the Church and on the grounds that will be available to you on your wedding day. 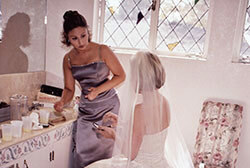 When you have your wedding at Church of the Wayfarer you will enjoy the use of our Bride’s room, which is large enough for the Bride to have her hair and make-up done and to enjoy some time with her bridal party. Our Groom’s Study/Library is a quiet, peaceful space for the lucky man to gather his thoughts before his big moment. The antique-walnu t paneled sanctuary here at Church of the Wayfarer seats 200 guests. The center aisle is 61 feet in length from door to altar, 4.5 feet wide (3.10 wide with aisle candelabra). 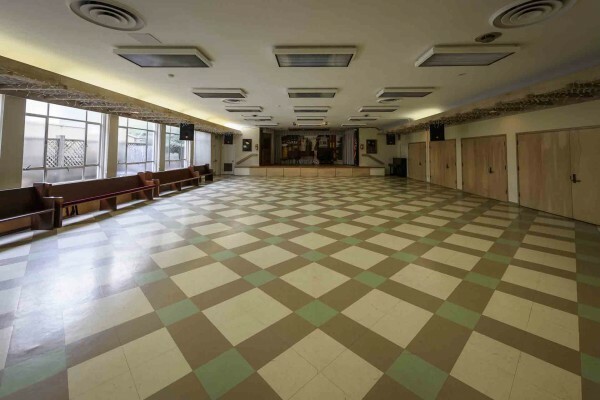 Carlson Hall offers an intimate space for small receptions but can also accommodate up to 100 people for a sit-down dinner. Our verdant garden, with its colorful flowers, quaint brick paths and lovely arbors, is a gorgeous location to hold an outdoor ceremony. It’s also a wonderful place to take photographs, and for friends and family to gather after the joyous occasion. We welcome children at Church of the Wayfarer. For your convenience we have nursery facility. You are responsible to hire any needed childcare personnel. Our church has a huge bell in its steeple that you can ring following the ceremony to tell all of Carmel the good news of your commitment to each other. 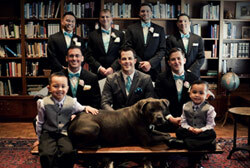 We welcome our animal friends and encourage you to include your beloved pets in your special day. The city of Carmel does not allow the throwing of rice, birdseed, confetti, glitter or flower petals outside the church. 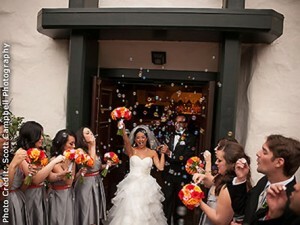 Guests may blow bubbles to celebrate the couple. 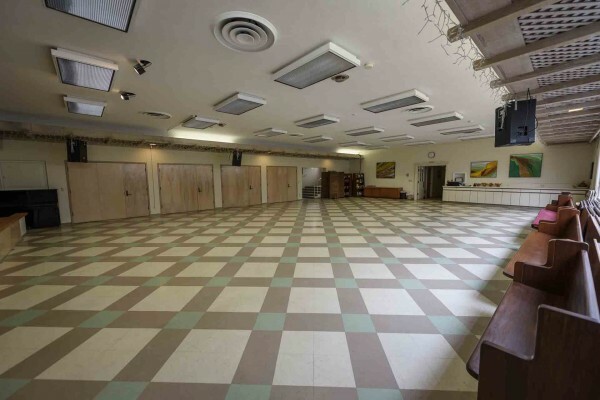 Church of the Wayfarer has no off street parking (except two spaces we can reserve for the wedding party). Your guests should plan to walk a block or so when they arrive. As they do so they will enjoy seeing the trees and charming cottages. Smoking is prohibited on Church property. We thank you for respecting this beautiful space.